To support world usability day 2010 Hanona.org offered 10 half hour Website reviews by resident screenreader user Adrian Higginbotham. I took up @ahiggi ‘s kind offer, and on 12th November he reviewed this site. Here is the report. I’m going to have a look at some of the issues identified and see how the guidance in BS8878 might help me deal with them. Hanona.org is a network of online and education professionals who believe in the power of technology and the importance of the user. If you’d like to talk to us about the contents of this report, or any of your Websites or projects do contact us via the details on our site. This review is not an audit against any particular set of accessibility guidelines or standards but rather is an account of one individual’s experience of using a screenreader to visit your Website. This report can be used as one indicator of things your Website does well, and areas you may need to look at with regard to access for older or disabled users. The review was carried out using MS Internet explorer 8, and the Jaws for windows screenreader version 11. Jaws isn’t the most standards compliant screenreader but is the most common by market share. If you want to try out a screenreader for yourself then I recommend NVDA, available from www.NVDA-project.org and works with MS Internet Explorer, or Firefox. (not Safari or Opera). I’m not familiar with Posterous so spent 5 or 10 minutes exploring Posterous.com getting to understand it’s features and purpose before reviewing your personalised area. The site has plenty of structural elements on each page which give a screenreader plenty of anchor points on the page to jump between for the purposes of navigation. This is useful in that it means I don’t need to listen to every line of text on the page but can, as soon as I’ve built up a minds eye picture of the page move very quickly between areas of each page. On this particular page however all sections and posts are indicated with the same header1 element. While this does in part assist navigation it would be more helpful if headers used ordinal numbers which reflected their hierarchy within the page structure. Strangely each post does in fact seem to be marked by 2 headers, the first containing only a ‘0’ and the second the name of the post. This is slightly confusing and irritating at first but as soon as I realised that it happened consistently at the start of each new post it stopped being a problem. The page contains a frame with the name ‘f2a25caa59958ac’ which is not particularly meaningful in that it does not tell me the purpose of the frame nor what it contains. Within that frame sits a Flash object within which my screenreader can not detect any content such as text, buttons etc. Based on experience I have assumed this frame to carry an advert. The page also contains a number of other Flash objects where media has been associated with a post. These objects show some irregular behaviour in that within a post containing a Audioboo demo individual buttons are identified by my screenreader and can be activated from the keyboard, although the buttons themselves have not been given text labels so are reported only as ‘button 1’ ‘button 2’ etc. However, in the post on Cloudworks virtual fieldtrip, although there is only 1 button identified, it is cleary labelled ‘play’. It would be useful to know if these differences are due to the source of the media or the means by which it was added to Posterous. Each post also contains a ‘Twitter for websites’ and a ‘Facebook like’ frame. Both are clearly named, and the actionable elements (buttons) with each named and actionable from the keyboard. Having so many frames with the same name per page could be confusing if navigating around the page by frame elements and it is mildly frustrating always having to jump past these but as each new post is marked with a header tag to do so is simple. Post content including Links to other sites or to download resources all work exactly as would be expected. The RSS subscribe link is cleared label with text (not always the case) and moving between pages is beautifully simple using either the in page controls or simply by adjusting the page number in the address bar. 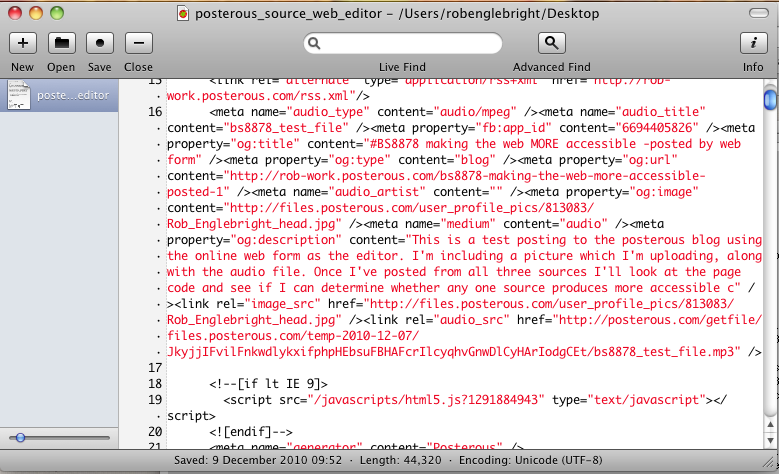 Considering that that Posterous is a mixed media, user generated content site the experience of access to your pages is good. No issues that an experienced screenreader user can’t easily and quickly adapt too and nothing that is likely to catch them out or prevent them from accessing information on the page. However as is usually the case with user customisable interfaces, many of the features comment on in this report, positive and otherwise may be attributable to the theme you have chosen. Change this and the user experience may vary significantly. I’m 36 years old and a programme manager in the public sector. I live in the west midlands (UK) with my partner and our two young children. I’ve been totally blind since the age of 4 and have grown up with technology and learned through my education and career to depend on access to it. I have used screenreaders to access the Web and online services for over 12 years.